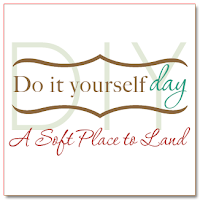 New projects, inspirations and a big craft room reveal is coming soon so make sure to check out my new blog BlessedLovedandBeyond! I am still here! I am lurking on the blogs more these days than actually posting to my own. But only because we made the executive decision that all big house projects, DIY, decorating, etc. needs to be put on hold for now. The hubby was laid off and so some sacrificing is needed. But it is still not stopping me from doing FREE or close-to-nothing projects around the house. As a "Design Challenge" for myself, I decided to create a Craft Room/Closet on a budget of $0.00-$40.00! Yup, that is my commitment and my challenge. It might not be the best breath-taking Craft Room, but in the end, the joy of winning my own challenge will be gratifying enough for me. And who knows, I might inspire one or two of you on the way. Like any big projects, breaking them into small little projects helps with your time and sanity. I drive myself crazy with little details before tackling big details, so this helps organize my thoughts and action plan. 1. Choose Your Space: We are blessed with a home that has PLENTY of storage space. For me, I knew I did not need (or require) a whole room, so this semi walk-in closet in our basement was perfect. You find multiples of things you thought you didn't have! I had no idea I had 11 scissors! Where are they when you set out everyone in the house on a mission to find just one? I shopped my house (and my parents' house..hehe) for furniture and came up with an old desk that needs some TLC, a three-shelf bookcase, a chair, and several other misc. items such as baskets, tin cans, etc. And that completed Phase 1 at $0.00! Next up, Phase 2: Choosing a Color Palette and Painting! You might have come across some DIY Christmas wreaths being done all over blog land. One of the easiest tutorials I found on how to make your own Christmas wreath was over at Eddie Ross where this one was made. Just beautiful! Thrifty Decor Chic got inspired to do one of her own as well. A lovely match to her chic and lovely dining room! My Christmas colors this year are gold with red accents. So I headed over to Walmart to buy an assortment of gold ornaments. I got a box of 24 ornaments for only $4! Here is my lovely gold wreath. Here is how I did it. I basically followed the Eddie Ross tutorial. Step 1: Find yourself a wire hanger in your closet, gather (buy) some ornaments and a pretty ribbon. Step 2: Shape your wire hanger into a circle and undo the end. Step 3: Begin by threading the ornaments on the wire hanger. Step 4: Once you have all your ornaments threaded through the wire hanger, you can close the ends. You will need pliers or scissors to do this. Snip off the extra wire with scissors. Step 5: Hang your wreath with a pretty ribbon. I hung my wreath using a 3M hook. It was my first time hosting Thanksgiving this year. We were only having my parents and sister over, so very low-key no pressure. But I still wanted the table to be festive - without spending a penny. Very doable with these two ideas! First, I had seen the cutest Thanksgiving place cards over on Kimba's DIY Day. Turley Times made these adorable place cards for Thanksgiving and I knew I had to recreate (a.k.a copy!). Cost for this project: $0.00. I had the ribbon, vellum paper, card stock, pine cones and of course a printer. Here is what I did. I printed my Thanksgiving message (THANKS) on vellum paper. I cut circles of card stock paper a little bigger than the vellum paper. I hole punched both vellum paper and card stock and tied a ribbon through to attach them together. I then stuck the branches through the card stock and the bird food - and voila! One of the easiest projects ever! And here is the low-key and extremely casual (and cheap!) Thanksgiving table. During my Small Group tonight, we were discussing obstacles in learning and contemplating on God's Word and scripture. I am very bad with this and I can recite maybe two or three verses from the Bible at most! 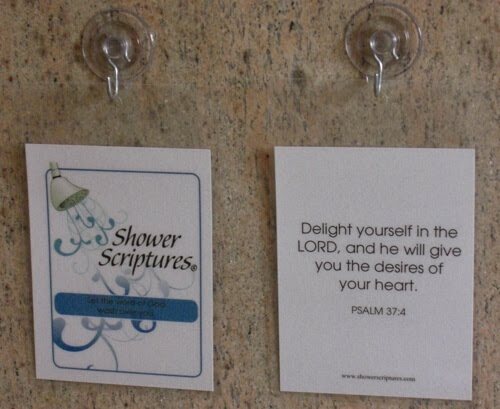 So a Small Group member mentioned Shower Scriptures. How great is this idea? Instead of letting your mind wander about all the things that you need to get done for the day, you are now contemplating on God's word and feeling renewed both body and mind! Such a great concept! I am considering getting one of these for the master bathroom shower - or attempting to make one myself. Such a great idea! I love neutral colors - and I have seen many Fall neutral decor. It is interesting since my first tablescape could pass more as "Fall", but breaking away from the greens, oranges, deep reds and browns is totally okay when you decorate for the Fall. Again, I worked with what I had around the house, with the exception of getting new napkin rings and scented pine cones from Walmart and new napkins from Burlington Coat Factory (they have a great home decor/furniture section!). Robin from Happy Home presented me with my very first blog award! Thanks Robin! So sweet of you! Make sure you go over to her blog and check out her bead board in her bathroom! 2.) Share "10 Honest Things" about myself. 1. I am scared of the dark and sleeping by myself. Thank God for hubby to help with the latter. 3. I would have loved to be an actress or a performer of some sort. 4. Since I missed the boat on #3, my dream job now would be to design and decorate. 5. I am easily shaken by these stupid studies they come out with every minute that makes us second guess our every decision. 6. I am not confrontational but can think of way too many times where I should have been for my peace and ease of mind. 7. I hate public speaking. It scares me to my bones - which I don't get because I wouldn't have minded being a performer. 8. I can't wait to be mother of the bride one day but at the same time, I CAN wait to be mother of the bride one day. 10. I think I am addicted to the blog world! 3.) Present this award to 7 others whose blogs I find brilliant in content and/or design, or those who have encouraged me.I would like to pass this award to the following haute blogs so make sure to check them out! 4.) Tell those 7 people they've been awarded HONEST SCRAP and inform them of these guidelines in receiving. What is your Bible Verse? Did you know that the Bible has a special verse for your birthday? "Now you are the body of Christ, and each one of you is a part of it." What is yours? Try it! I am loving it all black! I decided to use the three chairs I purchased at a thrift store recently instead of the chairs that came with the table. They gave the table height and matched perfectly. But now I am on the hunt for a fourth chair, grrr! Note to self: purchase chairs in even numbers next time! I used my fine china and stainless steel silverware over silver chargers, but to counter-balance the elegance, I used sisal place mats and quirky glassware. I added variations of candlelight for coziness and mood, and a centerpiece with fruit to give the table life. I placed a basket to hold the extra silverware for a rustic element. 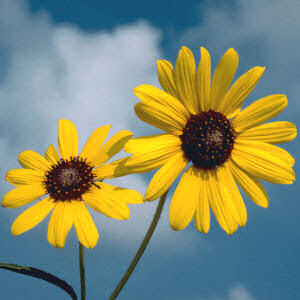 And the sunflowers add color while complimenting the earthy tones. I remember seeing a "No Soliciting" sign with the same idea. Step 1: Choose your frame. I liked the design on this one and also the fact that it was bare wood and ready to be used. I got this particular frame from Walmart. 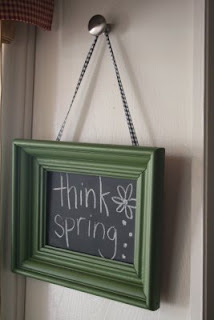 But you can use any frame, in any shape, in any condition for this super easy project. Step 2: I took it apart and sanded very lightly. Step 3: And, you guessed it, Heirloom White Spray Paint comes next. I actually ran out as I was spray painting but it ended up being a blessing in disguise. I liked the fact that it was not a perfect coverage and some of the wood showed through. Step 4: While the frame was drying, I painted the glass portion of the frame with chalkboard paint. Step 5: Once everything was dry and ready, I used a piece of leftover jute rope (couldn't find anything else at that moment) and hung it on my front door. Ta da! Now go visit 320 Sycamore for more great chalkboard ideas! All graphics, images and content on this blog (unless stated) are the intellectual property and copyright of Haute Decor Gal. No images or content may be used without written consent.